We investigate the nonlinear dynamic response of a device made of two electrically coupled cantilever microbeams. The vibrations of the microbeams triggered by the electric actuation lead to the redistribution of the air flow in the gap separating them and induce a damping effect, known as the squeeze-film damping. This nonlinear dissipation mechanism is prominent when encapsulating and operating the microstructure under high gas pressure. We present different modeling approaches to analyze the impact of the squeeze-film damping on the dynamic behavior of the microsystem. 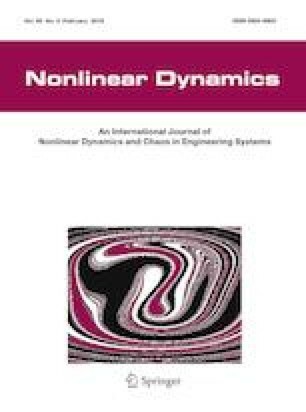 We first develop a nonlinear multi-physics model of the device by coupling Euler–Bernoulli beam equations with the nonlinear Reynolds equation and use the Galerkin decomposition and differential quadrature method to discretize the structural and fluidic domains, respectively. We consider also another modeling approach based on approximating the squeeze-film damping force by a nonlinear analytical expression. This approach is widely used in the literature and referred to as partially coupled model in this paper. We conduct a comparative study of the nonlinear dynamic responses obtained from the two models under different operating conditions in terms of electric actuation and applied pressure. The simulated frequency and force-response curves show the limitations of the partially coupled model to capture properly the microsystem dynamics, especially when approaching the onset of the pull-in instability and exciting the microsystem with an AC voltage near resonance. As such, we propose a correction factor to the partially coupled model which is much less computationally demanding to obtain good match with the fully coupled model. The selection of the correction factor depends on the thickness ratio, the ambient pressure, and the excitation frequency. The influence of the ambient pressure and the thickness ratio between the two microbeams were also examined. We observe that operating the microsystem at a reduced ambient pressure or when reducing one of the microbeams’ thickness can lead to a premature instability of the dynamic solution which reduces the maximum amplitude of the vibrating microbeams. This feature can be exploited for switching applications but it constitutes an undesirable effect for resonators. The author M. Ghommem gratefully acknowledges the financial support via the Biosciences and Bioengineering Research Institute and American University of Sharjah Grant Number EN0277-BBRI18.